MONDAY, juLY 18TH, WE HAD A JAM WHICH STARTED OUT IN THE CONCRETE SKATEPARK IN lITTLE ROCK AND ENDED IN THE STREET AREAS OF DOWNTOWN LITTLE ROCK. In the beginning at the concrete park, Ken joined up with us and after a bit of a fall, decided to call it quits. Man, that dude has style for miles when it comes to park. Fakies here and there, double peg stalls on the coping, the works. Yeah. Those bowls in that park are so carvable and smooth. and very fast. Brandon, Mark, Chris, Will, Performer, and I had a great session all day and this is the low down of it all. Enjoy! At the park, the kids that showed up were riding like it was the last day ever. Non stop. Chris was trying turndowns and almost pulling them, Will was getting pretty high over the gaps all over the edges of the park, and Performer was trying one footers on the jumpbox. Nice. After a couple of hours, we pull into a gas station with $1.30 in change. Kris is like, "oh it'll make it, trust me." We get about 10 miles to Conway and the car bonks out. Wonderful. I was ready to start riding my bike to Conway down the freeway. Finally, after 5 minutes, a state trooper lets me call Michelle to tell her to pick us up in Morilton. On our way to Morrilton, the trooper picks up another lady who's car was broke down. Well, Michelle picked us up in Morrilton and we came back home around 2am. During this whole time, Kris' wife Anne is so mad. She is scared something happened. Well, she doesn't know the half of it. Justin- This man works at Sonic most of the time, but found time out of his busy schedule to come out and shred with us. He was jumping off of ledges and jumping gaps with the best of them. Oh Yeah! Justin Hartje- Everybody watchout! This kid is getting good fast! He was pulling the big gaps with the best of 'em and he was pulling them full throttle every time! He was also pulling 360 tailtaps every chance he got. He learned how to ride a slanted wall ride after we rode the skatepark. Justin is also getting very good at manuals. He'll get them soon. Yeah. Kyle Hick- Man, Kyle is getting better everytime I ride with him. 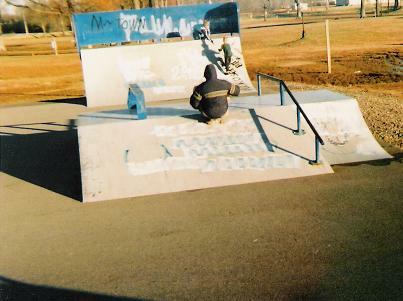 He was pulling manuals on anything he could and pulled some nice feebles. There is a red rail beside a building and he tried to double peg it. So close, it'll happen next time. Oh, and Kyle, thanks for advertising this site all over your car. You freakin' rule! Jason Weatherly- OK, now everybody who knows Jason knows that he is mister old school. He pulled some nice feeble grinds inbetween flatland sessions. Oh yeah, he also pulled a nice windsurfer. NICE! Colley Bailey- This dude is crazy! We went to the skatepark and he fires off stuff on the round rail like: feebles, smiths, crooked grinds, and rail rides. Sick. He did a 360 off of the stage by the caboose, and tried to bunnyhop up and manual the same stage. So close. 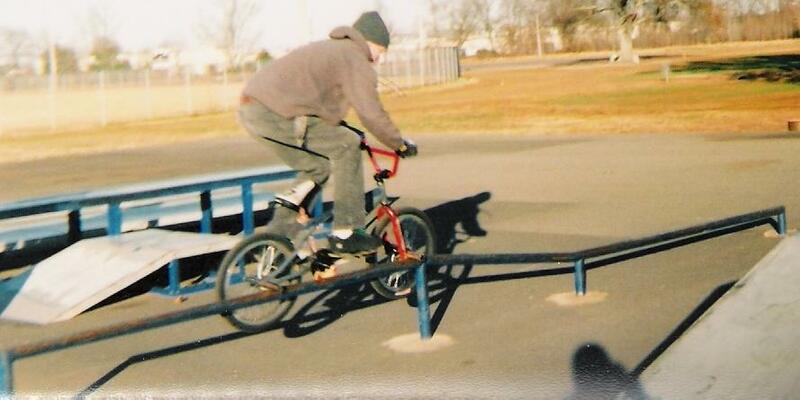 There was a rail by an ATM machine that was way taller than his bars and he decided to grind it. He attempted to barspin off of the rail also. Insane. Well later on, he did a couple foot plants on this ghetto wall ride that we came across and was also attempting to air out of it. Look at the pic to see how RAD this is. Last, he decided to hop over a huge gap into the road. Like a 12 foot gap. Flat gap, at that. Shawn McClure- Well, I had a pretty good day. Pulled some feebles, double pegs, and a smith grind on a ledge. I love gaps. I rode most of the gaps and dropped off of most drop offs. I did some 360 tailtaps off of some ledges and I finally did some 360 tailtaps off of 2 stairs. Progression. 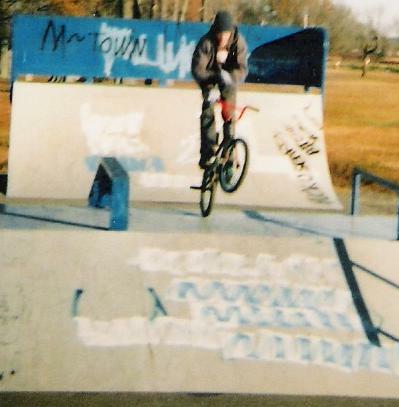 I did a couple barspins and a can can lander here and there. Johnathon was on rollerblades. Now don't dis bladers. I used to blade and the posers gave us a bad name. Well, this kid, was pulling 540's over stairs, 180s over gaps, and frontsides on some good sized rails. And the kid also pulled some nice flips and flat spins into some bushes. NICE! Ridin' and chillin' with your friends. Thank you Kris for getting the pics for the site, and Robert thanks for getting the footage for the next video. It's gonna be da bomb yo! Ok, now December 19th was my birthday and I wanted to pull off a jam in Searcy. I got my wish. We (Robert McClure, Kris Robison, Alan Copland, Mark Caradine, Ken Edwards, Scott Edwards and I) met up at the Searcy skatepark to session for a little while. Boy, it was cold! When we arived, Scott and Ken were already there, and they said it was to cold, so they left. Thats cool, at least they came. Kris, Robert, Alan, and Mark were pretty cold, as was I. I rode the park for about a half hour and then we decided it would be best to head to the next spot. Talk about warmer. I think it was warmer because of the buildings around us. Cool. We rode the triple level shopping center by Freds for seriously 2 to three hours. I almost pulled a 540 tire tap, Mark was busy doing pokemons, and we were all taking turns on the long board. Yeah. You can't get a crew like this together without some antics. Mark brought some air soft bb guns. Those things hurt! The bb is plastic, but leaves welts. If you shoot Alan, he gets mad. Even if he shoots you first. Well, he instigated and recieved. Kris got Alan in the eye and Alan was ticked. Oh well, have fun! Next to the triple level is a hospital that has some nice ledges and stairs. Well, there is a ledge that goes down some grass hill and is brick. You gotta see it to understand. It is like 8-10 feet high on one side and like 4 feet on the other. It is pretty long. I set my bike on the ledge (2feet wide), and proceded to grind it. I rolled down the most of it and shifted the peg to the ledge. So good. I did that 3 to 4 times and left to some ledges that were like 3 feet high. I tried to 360 tailtap off of them, but I crashed hard 3 times. I was done for a while. 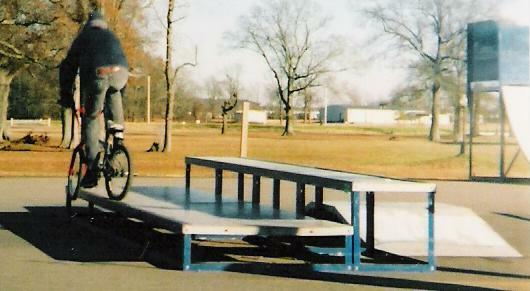 We were going to leave then I remembered a gap that I wanted to hit last time I was in Searcy. It is like 15 feet and downhill. I did a wuss run and landed in the grass like, a foot away from the curb. I went back and pulled it. Yeah. All in all, I had a pretty rad birthday. I got to chill with some good friends and family, and had a really good time. Thanks go out to Michelle, Mom, Dad, Shannan, Robert, Alan, April, Mark, Kris, Ken, and Scott. Some heavy sessioning went on in Little Rock on Monday, and I want to thank Clayton Blair for being such a wonderful host and good friend. Thanks. Robert rollin' over the pyramid on Mark C's longboard. Grinding the long kinked rail.